The 12th lucky winner to walk away with the Montero for December 2016 is Gunarathnarajah Ariyarathnam from Dehiwela. 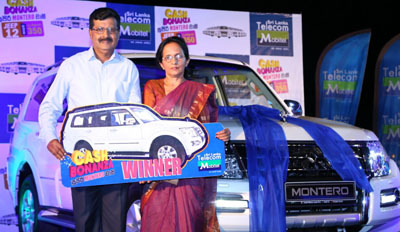 For 2016, 11 lucky winners walked away with a luxury Montero each from Mobitel. The Cash Bonanza prize giving for December was held at the Mahaweli Grounds in Embilipitiya and commenced with a musical show where the performing band was ‘Seeduwa Sakura’ along with various popular artiste performances. On the day of the carnival, a special ‘Eye Clinic’ was held for valued customers where 1,000 customers were given spectacles free of charge along with an eye check-up done by qualified and experienced opticians.